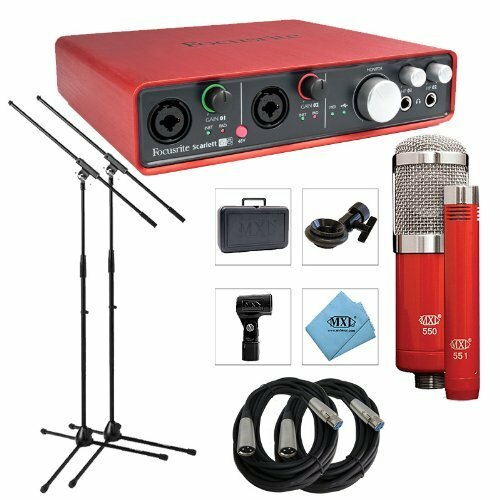 Get a complete recording system right out of the box with this specially priced bundle for the Focusrite Scarlett 6i6 USB Audio Interface which includes: (1) Set of MXL 550/551R Small and Large Diaphragm condenser microphones for recording any source, (2) 20ft. XLR Cables to connect the 550/551R to the Scarlett 6i6, and (2) Microphone Boom Stands to perfectly position the microphones.This unit comes with Focusrite's Red 2 & Red 3 Plug-In Suite (AAX/AU/VST). Free upon registration of interface. Accurately designed on the heralded Red 2 EQ and Red 3 compressor, these plug-ins let you exploit the sound of the originals conveniently within DAWs like Pro Tools® (10 and above) and other audio software. (2) Microphone Boom Stands to perfectly position the microphones.